Here is another fun cook on the Weber Jumbo Joe with a spatchcock chicken. 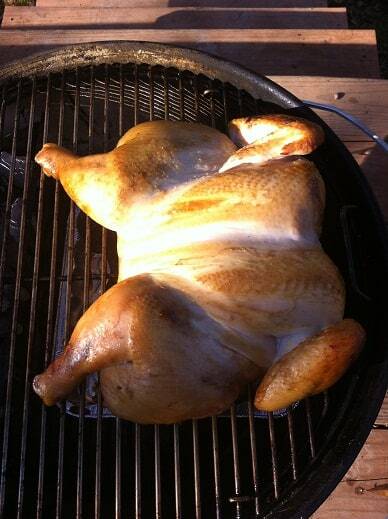 The bird turned out beautifully and does a great job of showing how much space is available on the Weber Jumbo Joe. For those of you that have never done a spatchcock chicken I have a few pictures to walk you through the process. Spatchcock is just another name for “butterflied”..not really sure where the term came from. 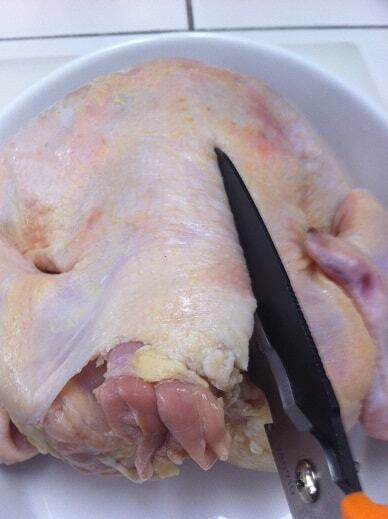 Start by taking a pair of heavy duty kitchen shears and cut down one side of the bird’s backbone. Some people only cut down one side. I like to cut down both sides and remove the backbone completely. 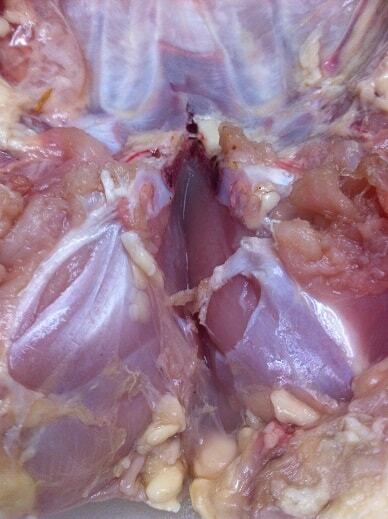 Once the backbone is out take a chef’s knife and gently put a split in the little bone that holds the breast cartilage. This will allow the bird to completely flatten. 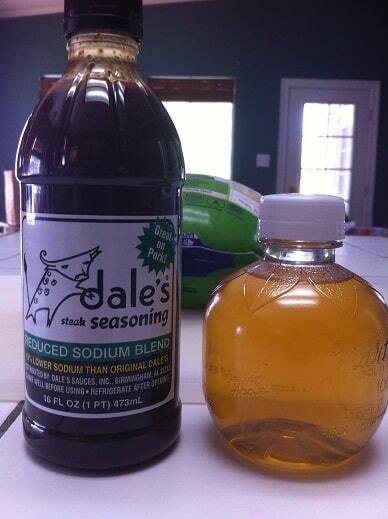 This next step is completely optional; I was playing around and decided to inject the bird with a 2:1 mix of apple juice and Dale’s low sodium marinade. 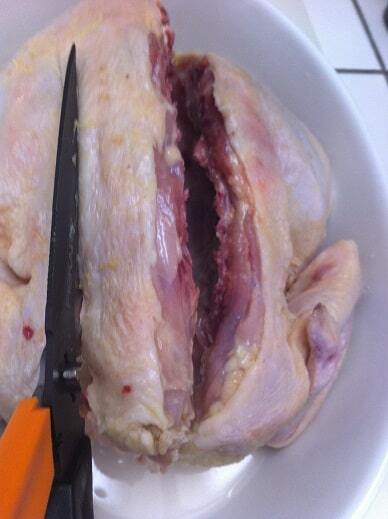 I injected the legs, thighs, wings and breasts. I brushed the excess injection mixture onto the skin. Like I said, you could skip this step completely and go as simple as seasoning the bird with salt and pepper. I set up the Weber Jumbo Joe with a charcoal basket almost filled with unlit Kingsford. 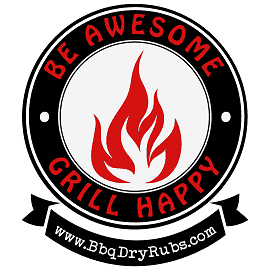 A drip pan went on the other side of the charcoal grate. 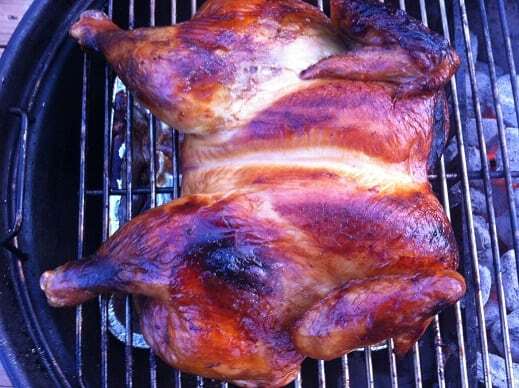 The bird was placed flat on the Jumbo with the legs pointed towards the charcoal basket. 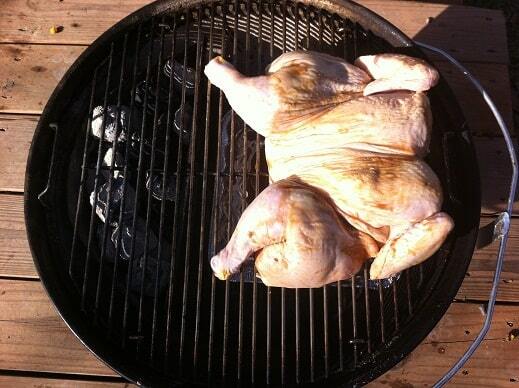 I added a dozen fully lit briquettes to the charcoal basket then closed the lid with the dome vent over the chicken. 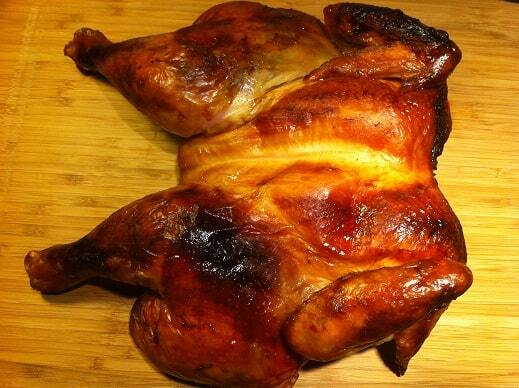 Here is what the bird looked like at the thirty minute mark. I didn’t do anything to the bird or grill at this point; just took off the lid, snapped a picture and put the lid back on. Here is the bird at the one hour mark. 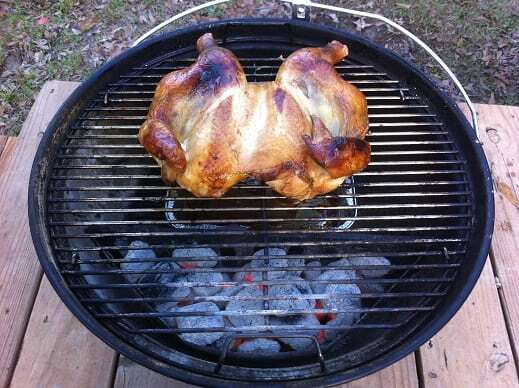 At this point I used a pair of metal tongs and rotated the bird so the breast was facing the charcoal. I closed the lid again and let the bird cook for another 30 minutes. Here we are after 90 minutes on the Weber Jumbo Joe. 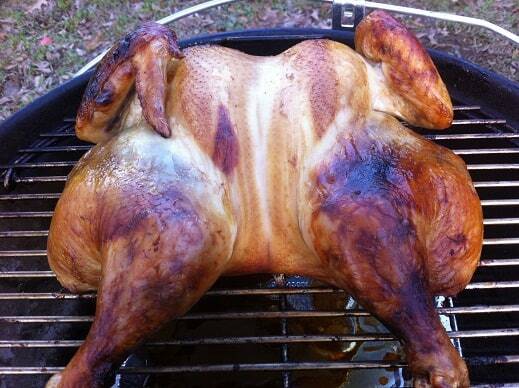 The bird looked awesome and read an internal temperature of 175F in the breast. I had to be careful when I moved this off the grill; the leg quarters wanted to fall off! 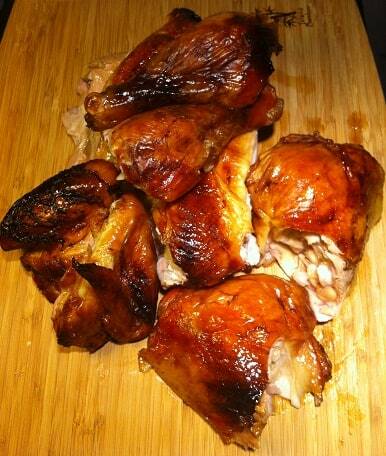 I let the chicken rest for thirty minutes then carved it up. I really liked the flavor the injection brought to the party. This was a fun cook. If you buy the hinged grate you could easily grill two spatchcock chickens on the Weber Jumbo Joe using the inverted grate technique I wrote about for grilling twenty chicken thighs. I never cook poultry over 160. 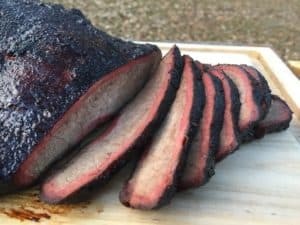 It is well done at that point and starts to lose moisture and the muscle integrity starts to breakdown turning it into mushy smoked meat or worse yet dry it out completely . I do realize you injected it which helps in moisture retention if you overcook it. Resting is important as that allows the meat to finish the cooking process.